Residents are taxed on their worldwide income. An individual is a resident if he stayed in Indonesia for 183 days in any 12-month period or if resident in Indonesia with the intention of staying in the country. Married couples are generally taxed jointly but may opt for separate taxation if there is a pre-nuptial agreement between husband and wife. Income is classified as follows: (1) income from business or independent profession, (2) employment income, and (3) other income (including interest, dividends, insurance payments, royalties, lottery prizes, gains on sales or transfers of property, foreign exchange gains, insurance premiums, and any other income which has not yet been taxed). Taxable income from different sources is computed separately. Taxable income from all sources are then aggregated and taxed at progressive rates. Rental income is taxed at progressive rates. Income-generating expenses are deductible when computing for the taxable income. Rental income earned by resident individuals is subject to 2% withholding tax. This tax is deductible against the final income tax liability. Sales of luxury houses, apartments, townhouses, and condominium units are subject to 20% sales tax. 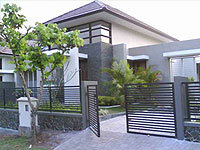 Luxury houses and townhouses have a selling price of IDR20 billion (US$1,376,107) and above. Luxury apartments and condominium units have a selling price of IDR10 billion (US$688,054) and above. Property tax is levied at progressive rates on the assessed value of the property. Income and capital gains earned by companies are taxed at a flat rate of 25%. Income-generating expenses and operating expenses are deductible when computing for the taxable income.